With silicone for easy ironing. Speeds up ironing. 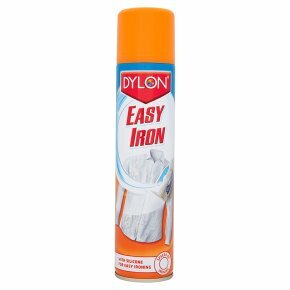 Experts in colour.Why spend more time ironing than you have to when Dylon Easy Iron takes the hard work out? Simply spray & iron. Its silicone content helps your iron glide over even though creases for smooth, beautifully wrinkle-free fabrics. Directions Adjust iron heat to suit fabric. Turn arrow on spray button towards mark on can rim. Shake can before each spray. Hold can at 45°angle & spray 20cm from dry/damp fabric. Allow to soak in briefly before ironing. Helpful Hints Effective on all washable (Not dry-clean only) fabrics including shirts, trousers, denim, curtains, bed & table linen. Test on dark fabrics in discrete area before use. If spray is blocked, rinse nozzle under warm running water. Iron Aid Easy Spray ca make hard surfaces slippery, if so please take care.